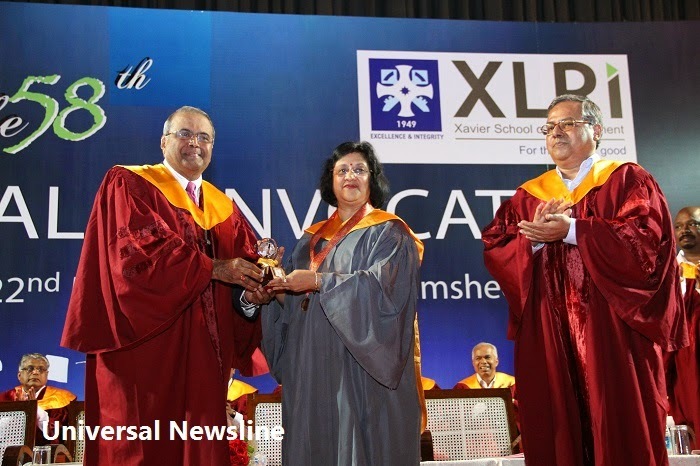 The momentous occasion of Convocation was celebrated today at XLRI- Xavier School of Management with great zeal. Students donned their hats and gowns and received their diplomas at the 58th Annual Convocation. At the ceremony, in continuation of almost forty-five years tradition XLRI conferred the prestigious ‘Sir Jehangir Ghandy Medal for Social and Industrial Peace’ on Ms. Arundhati Bhattacharya, Chairman of the State of India. Mr. H M Neruakar, Chairman, Board of Governors, XLRI presented the prestigious medal to Ms. Bhattacharya in presence of Fr. E Abraham S.J., Director of XLRI and other dignitaries. After two years of strenuous schedules and academic rigor the batch of 2014, comprising 245 students of Post Graduate Programmes in Management, 5 students of Fellow Program in Management from Jamshedpur Campus and 35 students from Executive PGP course from Dubai Campus, received their graduating certificates and medals displaying a sense of pride and sorrow. This year, 119 students of 2013 batch of 15-months PGDM (General Management) Programme also received their graduating certificates and medals. Pride was apparent among the students as they joined the elite club of XLRI alumni and sorrow was not far behind as they realized that tomorrow they leave an exciting and fun-filled learning environment to enter into the harsh realities of working life in the demanding corporate world. Expressing her gratitude to XLRI, Ms. Arundhati Bhattacharya said, “I am really honoured and humbled at being conferred the prestigious ‘Sir Jehangir Ghandy Medal for Social and Industrial Peace’. Ms. Arundhati Bhattacharya also delivered the convocation speech to the graduating students. She congratulated and inspired the students with hER words and shared some of her experiences on common challenges which they can face in their future lives as employees. On this significant occasion, reading out the annual report of the institute Fr. E Abraham S.J., Director of XLRI focused on the achievements and milestones of the institute during the academic session 2013- 14. “Today is an important day in the life of every student, faculty, and staff. It is the high-point of all the efforts put in by an individual during their time at the campus. This year has once again brought laurels to XLRI in different spheres that have done us proud. XLRI has made its presence felt on the academic ground particularly at the international level and contributed on social grounds as well. Our institution has been awarded various distinctions and also our students have won us even more glory at different academic forums. Today, we have with us the international students of the Global MBA Programme. XLRI has also adopted two villages in Jharkhand under the project ‘SUGRAM’ that aims to shape the two villages as model villages thereby empowering the underprivileged communities to shape their development through holistic and sustainable approaches”, he said. “We are honored to have Ms. Arundhati Bhattacharya among us as the first woman in XLRI’s 65 years of existence to deliver the convocation address and the first lady recipient of Sir Jehangir Ghandy Medal for Industrial and Social Peace. She is the first woman Chairman, State Bank of India which holds a legacy of 208 years. In her extensive service in SBI, she has handled almost every function. She has been instrumental in setting up several new companies/initiatives of the Bank and has always been sensitive and empathetic to gender issues in the bank, introduced a sabbatical facility upto two years for the women employees in SBI Capital markets as MD and subsequently in the Bank as Chairman and has been a member of the expert committee of bankers to prepare a blueprint for the first all-women bank” he added. “It is a special honour to have with us this evening Ms. Arundhati Bhattacharya, Chairman of SBI. As we all know, we are in the middle of a protracted economic slowdown, and the nation will need doyens of Banking like Ms. Bhattacharya to help us surmount the many challenges faced by the banking sector in particular and the economy at large. Ms. Arundhati Bhattacharya is an institution builder who thinks far ahead of mere QSQT (quarter se quarter tak) compulsions”, he added. strives to contribute its mite to the professional growth and management of innumerable organizations that serve the public - especially organized industry sectors, labour welfare, service agencies engaged in rural development, education, health and other public systems.